Internships are hands-on experiences that relate to a specific major or career interest and usually involve training and responsibilities for which the student has already completed appropriate academic coursework. An internship may be full-time or part-time for the duration of a semester or summer. Internships can be paid or unpaid. Mount students may also register to receive college credits for an internship. Four Mount students explain why they think internships are important, and what they learned from experiences at Estee Lauder, Morgan Stanley, M&T Bank, and the National Institutes of Health. Completed learning agreement and summer registration form must be submitted prior to starting an internship. The summer registration form is available through the Registrar's Office. Students are responsible for ensuring that all information is complete and accurate. Failure to submit the completed Learning Agreement or any additional items needed by the internship registration deadline date may result in credit registration being denied. Registering for an Internship starts with submitting the Learning Agreement. We think an internship is an essential experience to complement your Mount education. That is why the Career Center has dedicated resources for students and alumni looking for the right match. Students can search this dedicated online resource for regional, national and international job and internship postings; connect with alumni for advice or opportunities; and be recruited or promoted by faculty for internships or summer research on campus. Looking for that personal touch? The Career Pathways program links current Mount students with alumni in their field of study so they can tap into the power of the Mount alumni network. Students can shadow a professional for a day, gain inside tips about an industry or company they are interested in, or even find a personal mentor in an alumnus who is doing job they’ve been dreaming about. With a campus close to Washington, D.C., many students choose to spend a summer living and working in our nation’s capital. The Mount in Washington is a credit-based internship program specifically designed to allow students to earn a semester’s worth of internship credit, live in dedicated student housing, and expand their professional network at some of the world’s most influential organizations. Not sure how to get started with an internship? The Career Center staff helps students prepare resumes, provides resources and information on how to find internship sites, and gives advice on how to narrow down your choices or work your personal network. Make an appointment to discuss your next steps in completing an internship or search our internship resource links. Why choose an internship for academic credit? Mount students can earn anywhere from 1-12 credits for an internship experience. The number of credits is determined in part by the minimum number of internship hours being completed and the internship description/responsibilities. Academic departments reserve the right to limit the number of credits registered. Review the Internship/Experiential Education Policies and Guidelines (eligibility criteria and expectations are included). Secure an internship placement. Discuss plans with the internship coordinator or faculty member as needed. Request a faculty member to serve as a faculty sponsor, and discuss plans together. Submit the Learning Agreement, with all signatures, to the Career Center prior to the deadline date. Expect that it may take at least a week, if not longer, to gather all signatures. Graduate students can earn anywhere between 1-6 credits for an internship experience. The number of credits is determined in part by the minimum number of internship hours being completed and the internship description/responsibilities. Academic departments reserve the right to limit the number of credits registered. Complete and submit the Learning Agreement with all signatures to the Career Center at least two weeks prior to the start of the session. Expect that it may take at least a week if not longer to gather all signatures. Complete online registration of internship. While all internships involve a great deal of personal commitment, an international internship promises to be even more challenging and rewarding. Many international organizations offer students significant responsibilities and experiences that cannot be taught in a classroom. Former Mount students who have interned abroad have regarded these higher levels of responsibility and expectations to be some of the best experiences of the trip—outside of the chance for traveling and exploring a different country. Interning abroad helps students develop personal strengths and skills that are useful in marketing themselves for future job opportunities. Contact the Career Center if you’re interested in interning abroad. “Studying abroad is about challenging yourself and stretching your limits. I have experienced this in many ways in London, but especially through my internship. This opportunity has given me a taste of how a business outside of the U.S. operates, which is valuable knowledge considering how global and interconnected the business world has become. When I get back to the states, I will bring this knowledge and sense of confidence with me and use it as I prepare for my career.” Kaitlin served as a research assistant intern with Brecker Grossmith, a commercial real estate business located in the heart of Soho, in the West End of London. Business major Bremen Clark, C'16, interned at the global headquarters of the Estée Lauder Corporation in New York City. 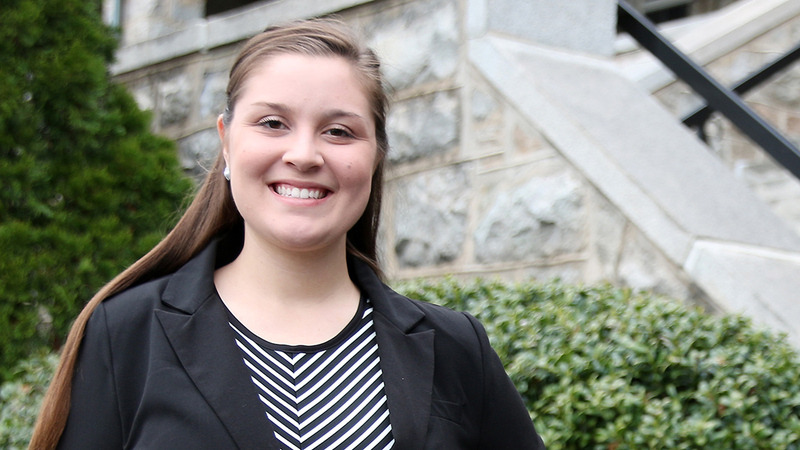 Accounting major Casteel Johnson, C'16, landed summer internships with both the Healthcare Banking Group at M&T Bank, and sportswear corporation Under Armour. Biology major Jianne De-Raya, C'16, had her internship in the laboratories at the National Institute of Health’s National Institute of Allergy and Infectious Diseases (NIAID). Music and business double-major Peter Kelly, C'16, interned for two summers with Hollywood music production studio Musikvergnuegen, more commonly known as MusikV. Business-finance major Vrunda Patel, C'16, enjoyed her internship as a summer analyst at Morgan Stanley. Environmental science major Tim Schwemler, C'16, stayed on campus and studied the science of beer thanks to a Summer Research Internship Award from the School of Natural Science and Mathematics. Business management major Marisa Small, C'16, spent a summer at Northrop Grumman in the Electronic Systems Division providing pricing support to analysts and not getting coffee.